Bilateral agreement differences are providing a check on the launch of services to Australia by Philippine low-cost carrier Cebu Pacific, which is interested in serving Melbourne and Sydney using its new fleet of A330-300s. The differences between Australian and Philippine authorities on an extension to their air services agreement is frustrating Australian airports, which have seen medium/long-haul low-cost carriers drive international traffic growth in recent years. Cebu Pacific would be the fourth medium/long-haul LCC to operate international services to/from Australia, joining AirAsia X, Scoot and Jetstar. The rapid expansion of AirAsia X in Australia, where the Malaysian carrier will become by the end of 2013 the fourth largest foreign carrier, was analysed in the first part in this series of reports on the Asia-Australia market. The Philippines is a much smaller market for Australia than Singapore or Malaysia. But there is potential for significant growth, particularly if a new LCC can enter, stimulating demand in a market which is highly price sensitive. There are currently only about 10,500 return seats weekly between Australia and the Philippines. That makes the Philippines the 13th largest market from Australia, smaller than even Fiji and Papua New Guinea. Four other Southeast Asian markets from Australia are at least four times the size – Thailand, Malaysia, Indonesia and Singapore. It is only slightly larger than Vietnam, South Korea, South Africa and Qatar. For the Philippines, Australia is its 11th largest market. The fact that Australia has the fifth largest overseas Filipino population and is the fifth largest country for inbound tourism to the Philippines shows the Philippines-Australia market is under-served and could benefit from LCC stimulation. 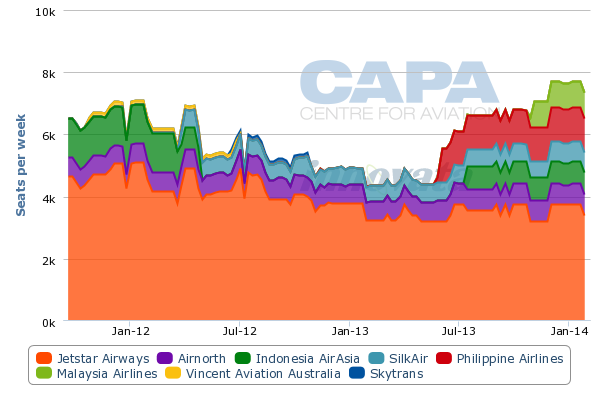 LCCs currently only account for 13% of non-stop capacity between the Philippines and Australia. Jetstar Airways, which serves Manila from Darwin, is the only LCC in the market. 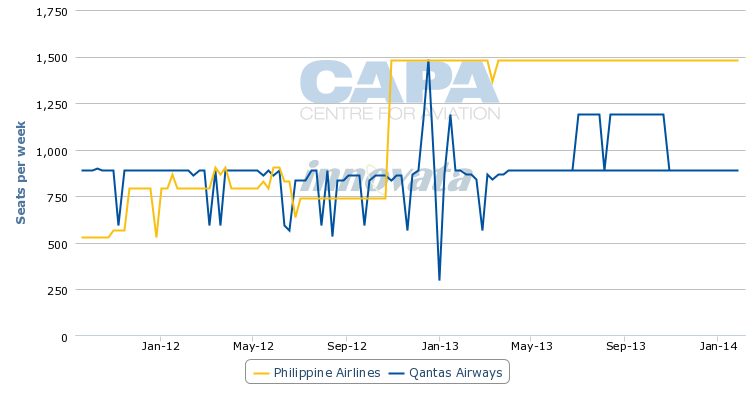 Philippine Airlines (PAL) – which operates non-stop flights to Melbourne, Sydney and Darwin – currently accounts for a leading 64% share of seat capacity in the market. 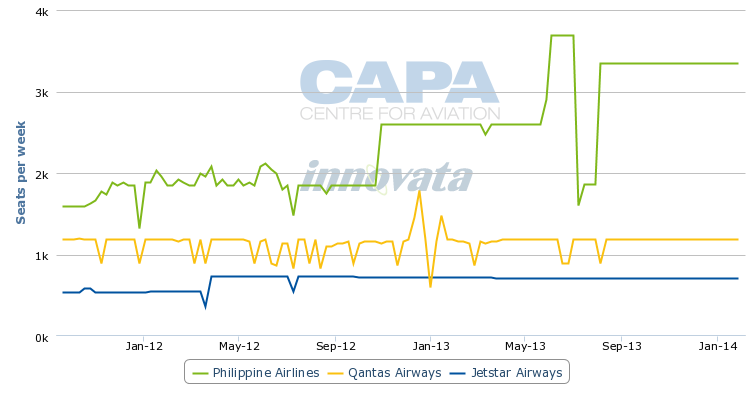 Jetstar’s parent Qantas, which only serves Manila from Sydney, accounts for the remaining 23% share. PAL has increased capacity to Australia over the last year by launching Darwin service and up-gauging some of its existing flights to larger capacity aircraft while Jetstar and Qantas capacity has been flat. Jetstar is unlikely to use its long-haul division to launch service to Manila from Melbourne or Sydney as the carrier does not have any additional widebody capacity in the short to medium term and is more focused on the outbound Australia market. Cebu Pacific is the logical new carrier for the Philippines-Australia market as the market mainly consists of the Filipino migrant worker and visiting friends and relatives (VFR) segments, the type of passenger Cebu Pacific is targeting with its new long-haul division. But the Philippines is also an attractive tourism destination that has largely fallen off Australian tourists' radar in recent years. Cebu Pacific became the fourth wideobody LCC operator in the Asia-Pacific region in Jun-2013, when it took delivery of its first of at least eight A330-300s. The carrier has outfitted its A330-300s with 436 sets in an all-economy configuration. Cebu Pacific is currently operating its only A330-300 on two short-haul routes that it has traditionally served with its A320 fleet, Manila to Singapore and Seoul. The carrier began using the A330 on Manila-Seoul on 4-Jul-2013, marking the start of A330 operations, and on one of its Manila-Singapore frequencies on 9-Jul-2013. Cebu Pacific reduced Manila-Seoul from 14 to seven weekly frequencies and Manila-Singapore from 32 to 25 weekly frequencies as it transitioned seven frequencies on each route from the A320 to much larger A330-300. The carrier’s first and so far only announced long-haul route, Manila-Dubai, will launch on 7-0ct-2013. Cebu Pacific is expected to take delivery of its second A330 within the next few weeks and plans to temporarily use the aircraft from 16-Sep-2013 to 4-Oct-2013 on one of its four daily Manila-Hong Kong frequencies before putting the aircraft on Manila-Dubai. Cebu Pacific’s new long-haul division has been looking the last several months at additional long-haul routes which it intends to start in 1Q2014, when it expects to take delivery of two more A330-300s. Cebu Pacific recently secured leases on a fifth and sixth A330-300s for delivery later in 2014 and in 2015, providing further opportunities to grow the new long-haul network. It continues to seek leases on another two aircraft, which will likely be delivered by the end of 2015. Cebu is currently considering additional Middle East routes along with Australia for 2014. But unless a new air services agreement between Australia and the Philippines is quickly negotiated – which seems unlikely given the current impasse – Cebu Pacific will have no alternative but to allocate the additional capacity to the Middle East. There is also a risk that no new deal will be negotiated in 2014, leading Cebu Pacific to use its entire initial widebody fleet of eight aircraft for routes to the Middle East along with some short-haul flights within Asia, which help from an aircraft utilisation and airport slot perspective. There is sufficient demand for Philippines-Middle East services potentially to support most of the eight-aircraft fleet. In addition to Dubai, Cebu Pacific has been looking at serving seven other destinations in the Middle East – Abu Dhabi in the UAE, Bahrain, Doha in Qatar, Kuwait City and three cities in Saudi Arabia – Dammam, Jeddah and Riyadh. All five of these Middle Eastern countries have significant Filipino migrant worker communities, which is the main target market for Cebu’s new long-haul operation. The carrier is not looking at pursuing business traffic, which explains its decision to go with an all-economy product while AirAsia X, Scoot and Jetstar’s long-haul division all offer a premium cabin. Cebu Pacific is attracted to Australia as the country also has a large Filipino population, which is smaller than the Filipino populations of Saudi Arabia and the UAE but larger than the Filipino populations in Qatar, Kuwait and Bahrain. All these markets are relatively under-served and have huge opportunities to stimulate demand. While Cebu Pacific’s long-haul division could survive by focusing entirely on the Middle East, allocating the equivalent of one or two aircraft to Australia would diversify the business and open up opportunities in a key and potentially lucrative market. Cebu is trying to also overcome some bilateral limitations in Middle Eastern markets, but there are still opportunities to launch services in most of the Middle East target countries, putting Australia at a competitive disadvantage as Cebu’s long-haul division evaluates its network options. PAL is currently allocated nearly all of the available capacity to Filipino carriers in the existing Philippines-Australia bilateral. Without the capacity limit being increased, Cebu Pacific could only serve Melbourne and Sydney with a less than daily service, which the carrier is not interested in considering. Opening a new long-haul market represents a huge investment and without the flexibility to serve the market daily in future makes the investment an unviable proposition. Unlike most of Australia’s other air services agreements, the agreement with the Philippines has historically included a cap which applies to all Australian airports. In most other agreements Australia applies a form of "open skies" policy; for example, the Australia-Malaysia agreement includes a cap that applies to the four main airports of Brisbane, Melbourne's main airport, Tullamarine, Perth and Sydney, but leaves the flexibility for unlimited capacity at other airports. The Australia-Philippines agreement was revised following the most recent round of negotiations to allow unlimited capacity only at one Australian airport, Avalon outside Melbourne. Avalon Airport, which is located about 55km from central Melbourne, currently only has limited domestic services. The Australia-Philippines agreement does allow for unlimited capacity from Philippine airports other than Manila International. But Cebu Pacific’s hub is at Manila, which accounts for 77% of the carrier’s current system-wide capacity according to CAPA and Innovata data. Cebu Pacific is only looking at operating its A330s at Manila as the fleet is not large enough to spread out across multiple bases and there is not sufficient demand from other bases such as Clark or Cebu. It is highly unlikely that Cebu Pacific can be persuaded to launch Manila-Avalon or Clark-Melbourne. The carrier wants Manila-Sydney and Manila-Melbourne as these are much more likely to be commercially viable. Both markets are relatively under-served and entry of a long-haul LCC would stimulate new demand, leading to significant growth. PAL currently serves Manila-Melbourne with three times weekly A340-300 flights and Manila-Sydney with four times weekly 777-300ER flights, according to Innovata data. Manila-Sydney is also served by Qantas with four times weekly A330-300 flights. Sydney is now served by Asia’s other three long-haul low-cost carriers, including AirAsia X from Kuala Lumpur, Scoot from Singapore and Jetstar International with service to Bali, Honolulu and Phuket. Sydney Airport has seen significant stimulation on the Kuala Lumpur and Singapore routes. As a result of the 2012 launch of services from AirAsia X and Scoot the number of Malaysians and Singaporeans arriving in Sydney has increased by 90% and 40% respectively, as CAPA reported on 16-Aug-2013. Sydney-Kuala Lumpur is a smaller market that was previously served by only one carrier, Malaysia Airlines, with two daily flights. 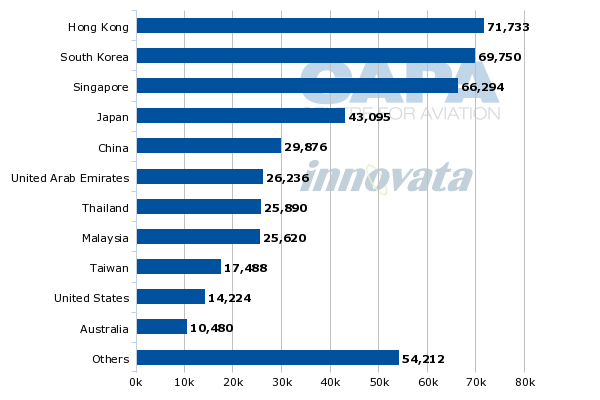 Sydney-Singapore-Kuala Lumpur is a larger market that was already served by three carriers – SIA, Qantas and British Airways – with a combined eight daily flights. Given Scoot only now accounts for about 14% of capacity in the Singapore-Sydney market, the 40% growth in Singaporean traffic is particularly impressive, demonstrating the traffic generation impact a price leader can have (although part of the Singapore stimulation is also due to Qantas' effective addition of capacity as it reroutes its connecting traffic flows via Dubai). Cebu Pacific's entry from Manila would be highly likely to have a similar impact on Sydney – if given the opportunity to serve the market. But a reluctant Filippino government would not especially want PAL's yields to be challenged, a potential outcome made more real where it only operates a four times weekly service. And, with the present standoff, Australia is not prepared to permit more than a five times weekly service to Sydney. Melbourne would also benefit significantly from the entry of Cebu Pacific as its third medium/long-haul LCC. AirAsia X has been serving Melbourne since 2008, where it initially drove about a 50% increase in Malaysian arrivals. Jetstar also currently operates four long-haul routes from its original Melbourne base – Bangkok, Bali, Honolulu and Singapore. Melbourne Airport CEO Chris Woodruff calls the recent round of Australia-Philippine bilateral negotiations disappointing as the talks concluded without an agreement to increase the current capacity limits. “There is no result there. There’s an airline there that wants to fly that can’t. I think that’s extremely disappointing,” Mr Woodruff said in an 8-Aug-2013 interview with CAPA TV on the sidelines of the CAPA Australia Pacific Aviation Summit. Jetstar already serves Manila from Darwin, where it offers onward domestic connections, but non-stop LCC widebody flights always have a far more meaningful impact. Jetstar’s Manila-Darwin service mainly accommodates the local market and is currently operated four times per week with A320s. Beyond the Philippines, the service continues on to Tokyo, with fifth freedom rights. PAL also entered the Manila-Darwin market on 1-Jun-2013 and operates the route daily with A320s. The flight has been operating as a tag with Brisbane and Perth, with a Manila-Darwin-Perth rotation operated four days and a Manila-Brisbane-Perth rotation operated three days. But the tags have not been successful. PAL recently decided to stop serving Perth from 3-Sep-2013. At least for now Brisbane will continue to operate with three weekly flights via Darwin. Brisbane and Perth would both prefer to see non-stop flights from Manila. PAL previously served Brisbane direct from Manila but dropped the route in Oct-2010. Brisbane Airport sees sufficient demand to support a non-stop widebody service, driven partially by the traditional strong inbound market from the Philippines to Queensland, which has Australia’s third largest Filipino population after New South Wales and Victoria. Brisbane Airport also sees growing outbound demand for the Philippines as the Philippines raises its profile as a tourist destination. The airport also sees Brisbane-Manila emerging over time as a strong connecting market. As PAL starts to pursue ambitious expansion in Europe, Australia would be a logical connecting market to focus on, which in turn could help support increased capacity across its Australian network. But PAL at this point is not planning to allocate additional widebody capacity to the Australian market, leaving Brisbane with a less than ideal one-stop product, which particularly impacts potential transit traffic for PAL. Tagging Brisbane and Perth with Darwin was a sort of compromise as it was feasible with A320s and PAL did not have the widebody capacity available for the new Australian services. But Darwin itself is a very small market and has become increasingly competitive since SIA subsidiary SilkAir launched services to Darwin in 2012 and Malaysia Airlines (MAS) prepares to enter on 1-Nov-2013. Indonesia AirAsia also resumed service to Darwin in Jul-2013, ending a 14 month absence. In the relatively limited local Darwin-Manila market PAL has to compete with Jetstar. In the broader Darwin-Asia market, PAL has to compete with SilkAir/SIA and soon MAS, which it does by offering lower fares in what has traditionally been a relatively high fare market. Queensland also has a sizeable Filipino community, accounting for 17% of the total Australian Filipino population. Western Australia accounts for 10% of the Filipino population in Australia, South Australia 7% and Tasmania 2%. Based on these figures Sydney, Melbourne and Brisbane (the capital of Queensland) could potentially support more capacity to the Philippines, particularly if an LCC enters any of these markets and stimulates demand in the migrant worker and VFR segments. Filipinos overall are the seventh largest migrant community in Australia, accounting for about 3% of the country’s overseas-born population and just under 1% of the country’s total population. Australia has the world’s fifth largest overseas Filipino population after the US, Saudi Arabia, Canada and the UAE. There is also a large student population in Australia, with 253,000 student visas issued to Filipinos in FY2012. In addition Australia issued 125,000 long stay business visas to Filipinos in FY2012. While student numbers have been on the decline in recent years, Filipino visitor numbers have been on the rise. Australia issued about 40,000 visitor visas to Filipinos in FY2012, an increase of 7% from the year prior. The entry of an LCC such as Cebu Pacific would be likely to stimulate demand in this segment, leading to more Filipinos holidaying in Australia and visiting friends or relatives working in Australia. Australia is also a growing generator of tourists for the Philippines. There were 103,000 visitor arrivals from Australia in 1H2013, an 11.5% increase compared to 1H2012, according to Philippine Tourism data. Australia is now the fifth largest source of tourists for the Philippines after Korea, the US, Japan and China. As Philippine authorities work to develop the country as a leading tourist destination, figures from Australia are likely to rise further. While the main target market for Cebu Pacific’s long-haul operation is overseas Filipino communities, its low fares will inevitably also stimulate demand in outbound travel from Australia to the Philippines. The carrier could potentially operate daily services to both Melbourne and Sydney and later also serve Brisbane. Assuming the current bilateral restrictions are lifted, Cebu Pacific could easily provide over 6,000 weekly seats to Australia. To double current total capacity levels between the two countries, Cebu Pacific would only need to operate a combined 12 weekly return flights to Melbourne and Sydney. The dispute between Australia and the Philippines is a classic case of mercantilistic bilateral pugilism. It involves end-to-end rights, beyond fifth freedom rights and third country codeshares. In a modern world where economic sanity should - and sometimes does - prevail, no sane person should ever have to learn what these terms mean. But, in the complex language of protectionism they are the holy grail. The implications can be far reaching and are almost always negative. With PAL unlikely to allocate more widebody capacity to Australia, Cebu Pacific is the logical carrier to unlock a new period of growth in the Philippines-Australia market. Cebu Pacific has faced international expansion hurdles previously due to bilateral policies designed to favour or protect PAL in several markets, but the impasse with Australia also involves a reluctance of Philippine authorities to provide beyond rights and slots for Australian carriers. Qantas is interested in codesharing with new partner Emirates beyond Manila but the current air services agreement only allows Australian carriers to codeshare with Filipino carriers. Qantas was able to secure so-called "third country codeshare" rights in the recent re-renegotiation of the Australia-Malaysia bilateral, but Philippine authorities apparently have so far been more reluctant. In this case, a third country codeshare occurs where the Australian airline uses the code of a third country's airline (Emirates) to provide seats between Australia and Malaysia. Emirates currently operates three daily flights to Manila from Dubai, giving Qantas passengers the flexibility of flying to Dubai (and beyond Dubai) via Manila as Qantas operates Sydney-Manila. Qantas would like to fully leverage its comprehensive partnership with Emirates by offering a wide range of joint itineraries via Southeast Asian destinations. Australia’s agreements with Singapore and Indonesia already allow third country codeshares but others including the Philippines and Thailand do not. A potentially larger hold up is related to beyond rights and slots for Australian-based Jetstar International. The LCC’s current Darwin-Manila A320 service currently continues onto Tokyo Narita. Singapore-based sister carrier Jetstar Asia also serves Manila-Osaka as a continuation on four of its 19 weekly Singapore-Manila frequencies, according to Innovata data. Jetstar successfully exploits a lack of LCC services between the Philippines and Japan, which stems from a Japanese regulation which currently prevents any Filipino carrier from launching new flights to Japan. Cebu Pacific is currently unable to expand in Japan beyond its current thrice weekly service to Osaka, its only Japanese destination, although there is some hope the regulation will be lifted following an ICAO determination earlier this year that concluded Philippine authorities are again in compliance with ICAO standards (the issue is not with the airlines themselves, but with the capabilities of the aviation oversight body). Jetstar would potentially be interested in serving more points in Asia from Manila but is unable to secure more slots at the congested airport. Australian authorities apparently would like Philippine authorities to open up Manila slots to Australian carriers in exchange for increasing the current capacity limit on Filipino carriers serving Australia. But such a request could be difficult to approve. Slots have become an increasingly thorny issue in bilateral negotiations in the Asia-Pacific region as carriers have run into challenges in several markets, making any traffic right gains from new air services agreements difficult to implement. But as slots are generally not controlled by the same authorities a request for confirmed slots in bilateral negotiations can threaten to derail the whole negotiation. Over the years, Japan perfected the negotiating art of using limited slots at Tokyo airports to restrict bilateral access; today China's airport's also suffer from excess capacity, not surprising in markets where 15% growth has been commonplace. Unless something moves the risk is the current impasse will continue and Cebu Pacific will continue to be shut out of the Australian market as it expands its widebody fleet. While Cebu Pacific’s widebody fleet plan for now only includes eight aircraft, with six so far committed, it is likely to seek additional aircraft for 2016 and beyond. The initial success of its long-haul operation and whether bilateral challenges in Australia and other markets are resolved will be an important factor as the carrier looks to revise the fleet plan for its new long-haul division. In addition to more A330s, an A350 or 787 order is a possibility, which could open up more potential long-haul routes. AirAsia has A350s on order while Jetstar and Scoot are both committed to acquiring 787s. US or European routes are not currently a possibility as Cebu Pacific remains on the EU blacklist and all Philippine carriers are prohibited from launching new services to the US because the Philippines still has a Category 2 safety rating from the US FAA. Cebu Pacific regardless is not interested in long-haul routes to Europe or mainland North America in the first stage of the development of its long-haul network while it is focusing on routes of under 10 hours. AirAsia X, which dropped longer-haul services to Europe and New Zealand in early 2012, and Scoot have also decided to stick to routes under 10 hours. This leaves Australia ideally positioned for Asia’s emerging long-haul low-cost sector as Australia-Asia, where flights in the six to 10 hour range are in the sweet spot for the long-haul low-cost model. Cebu Pacific service would complete a Trifecta for Australia, and particularly Sydney, resulting in services from all three of Southeast Asia’s long-haul LCCs alongside home-grown Jetstar. The only hold up is the air services agreement, which once again threatens to impede important international growth for Australia’s major airports. This is the second part in a series of reports on Australia-Asia markets. The next part will look at the recent rapid growth and huge opportunities in the Indonesia-Australia market.